ORXJ-1 is a 5port Xpressnet junction. It is designed for use with any Xpressnet device. This do-it-yourself (DIY) Xpressnet junction provides some features that may be useful. The best feature is that you only need to assemble the some RJ12 plugs to get a working Xpressnet junction. The other parts are optional. If you don't like or need all this stuff leave the parts out. The circuit works also with only 5 or less RJ12 plugs. 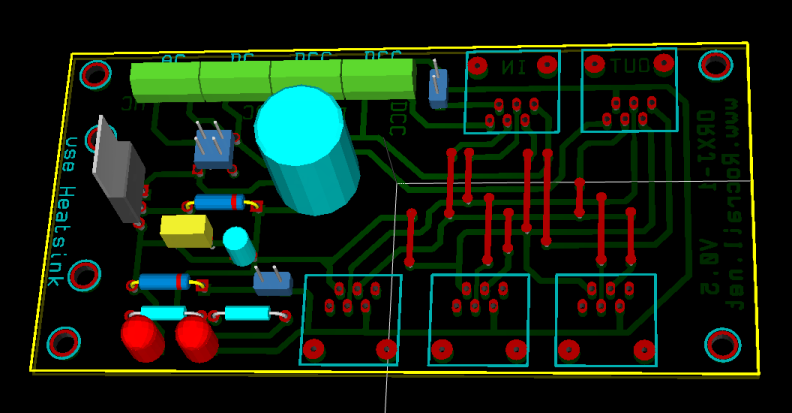 easy to etch 100 x 50 mm PCB, unfortunally some vias. The parts are available all over the world. To see the specs of the used parts click on the links below. There is also a Reichelt shoping cart. But they deliver only to germany. Anyway, there is a real chance to get these parts at your local electronic dealer. First assemble the small parts, Solder the via's, resistors and diodes. After that insert the screw terminals, the rectifier and Elkos. If this is done solder the rest. If you use the internal power supply you have to use a heatsink for the 7812 regulator. The heatsink has to be big enough to dissipate the heat from the 7812 depending on the power loss over the regulator. You connect a 18V AC transformer and your xpressnet devices have a consumption of 500mA. Check your pcb for shortcuts, especialy between the pins of the RJ12 jacks. connect a 12V transformer and measure if the power supply works. Read the chapter "usage" and test your pcb with Xpressnet devices. connect an Xpressnet cable from the command station or the previous ORXJ-1 to Xpressnet jack J1, LED D5 will light, LED D3 is off (if assembled). 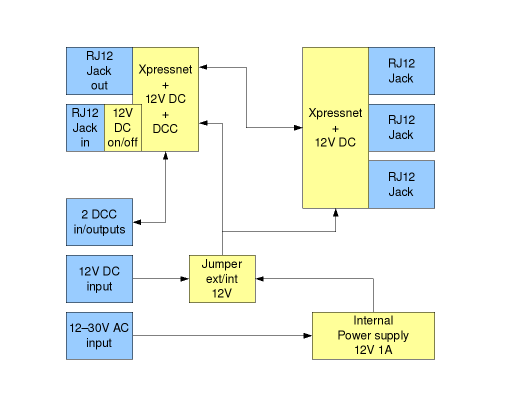 connect the next ORXJ-1 (if there is any) to Jack J2. optional you can connect the DCC signal with one of the DCC screw terminals. It will be forwarded to the next ORXJ-1. You can connect stationary decoders to the other DCC screw terminal. J3, J4 and J5 can be connected with Xpressnet throttles or other Xpressnet devices. connect a regulated 12V DC power supply to the DC screw terminal P3. The square solder pad is +12V, the round one is gnd. LED D5 will light, LED D3 is off (if assembled). connect an Xpressnet cable from the command station or the previous ORXJ-1 to Xpressnet jack J1. connect a 12 to 24V transformer AC screw terminal P1. LED D5 and LED D3 will light. If you have trouble building or using ORXJ-1 please write a post in the hardware section of the Rocrail forum.